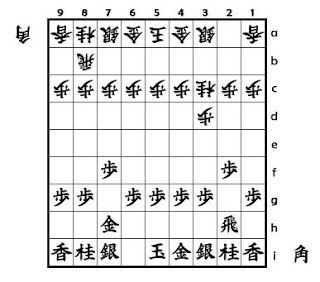 Shogi Opening Traps ; Yonteme San-San Kaku sepou . part 1. The diagram 1 is a variation of "Yonteme San-San Kaku senpou" . The move 4.G-7h prevents Gote's "Oni goroshi Mukai Bisha" ; 4...R-2b . If Gote moves 4...R-2b Sente can get advantage by following moves . In the diagram 2 , Sente have got advantages . 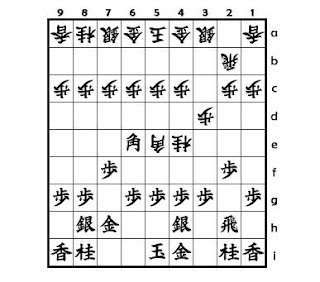 If Sente moves P-2e instead of 4.G-7h , Gote can get advantage by same moves . In the diagram 1 , Gote should move G-3b or R-4b .